Why read, study, and analyze the New York Times? One of the most pressing questions in contemporary academic- and professional-writing contexts, and in higher education is about the role of technology in our work. Some people argue that our increasing dependence on communication technologies is decreasing our collective sense of effective communication; others argue that our literacy practices are merely changing and evolving and that they have always changed and evolved — that “effective communication” is deeply contextual and rhetorical. The New York Times is an interesting primary source in this context. 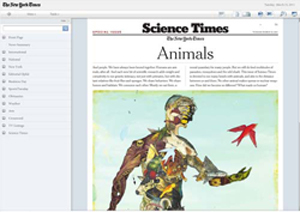 We will compare the writing, editing, and technologies in both the print and digital versions. The President of the United States starts his day with the New York Times, so you should, too.